To understand the Difference between Chartered Wealth Manager (CWM) and Certified Financial Planner (CFP) we need to first understand the Difference between Financial Planning and Wealth Management. These two terms Financial Planning and Wealth Management are very confusing and most people generally consider them as synonyms. But actually they are not synonyms. Wealth Management shall mean something wider than financial planning. Wealth management would include not only financial assets but any kind of wealth the advisor is hired for its maintenance, preservation and growing. From our point of view, domestic and international tax Law, corporate Law and Family Law should be considered as a part of the Wealth Management knowledge. So Wealth Management is more comprehensive, more detailed and better rewarded by Clients. Moreover Wealth Management is an established profession with most Banks in India and Globally also having thriving Wealth Management Divisions. 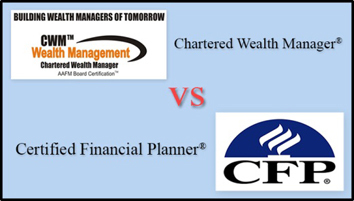 Now let us compare the Chartered Wealth Manager (CWM®) and the Certified Financial Planner ® (CFP®) Designation Programs. 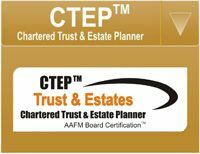 Global Certification in True Sense The CHARTERED WEALTH MANAGERTM certification is awarded directly by the parent body AAFM, US which makes the CWM certification truly global and is accepted globally without any territorial limitation. The candidates do not have to undergo any additional certification / examination if he / she want to pursue their career in any other jurisdiction. The CFP certification is awarded by the Indian Chapter i.e. FPSB India which restricts the certification to be global in true sense and is recognized in India only. The candidates will have to undergo additional certification / examination, if he / she want to pursue their career in any other country. 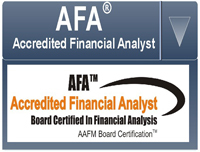 CWM Certification comes directly from AAFM USA while CFP Certification is issued by FPSB India. 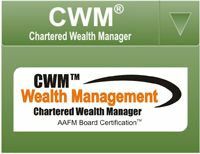 The CWM Certification is globally acceptable but to use CFP Outside India Students need to give extra exams called "Cross Border Exams"
Output from Certification CHARTERED WEALTH MANAGERTM (CWMTM) is unique and the Premier Certification in Wealth Management certification Globally. 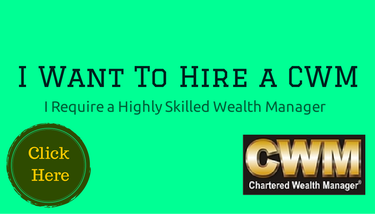 CWM certification is professional qualification for aspiring candidates who want to establish their career in Wealth Management and the professional who want to upgrade and enhance their skill set as per the mandatory requirement posted by the regulator and the industry CFP is a professional qualification for aspiring & experienced Financial Planners. CFP Certification covers all aspects of an individual’s personal finance needs like insurance, retirement, tax & estate, investment etc. Wealth Management is an established profession with most of the Banks already having Wealth Management Divisions. Financial Planning is a relatively new concept. Courseware for the Certification The Courseware for the CWM certification is provided by AAFM India approved from AAFM, US. The benefit of courseware provided by the Board will helps in the standardization amongst the industry and maintaining the education standards and quality. The courseware covers Global plus Indian content. The Courseware for CFP certification is not provided by the FPSB India. The Education Providers themselves have to develop the content for the certification which creates discord amongst industry from the perspective of standardization and standard setting. Further, the students are not clear about the nature of questions asked in the exam. The courseware covers Indian content only. Standardized Courseware for CWM is developed by the AAFM Board itself. Project Work There are 2 Project/Assignments which the Student has to complete for acquiring the CWM Certification. There is no project/assignment Requirement Project Work in Case of CWM ensures that the Student learns to Create Wealth Plan and is Job ready. Duration Candidates take an average of 6 months to complete the entire program Candidates take an average of 6 months to complete the program The time duration to cover both the programs is Similar. Pathway to Register Compulsory Pathway: The eligibility criterion to register for the CWM certification through Compulsory Pathway is that the candidate must have passed minimum 12th Standard but minimum a graduate to hold the certification. The eligibility criterion to register and hold the CFP certification through Regular Pathway is that the candidate must have passed minimum 12th Standard. It is necessary to be a Graduate to obtain the CWM Certificant while a 12th Passed Student can obtain the CFP Certificate. Experience Requirement Does not have any experience requirement. Minimum 3 Year financial experience Requirement. 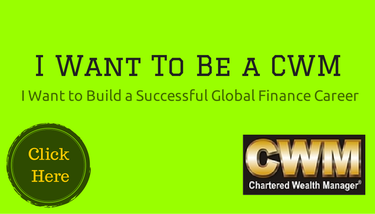 There is no experience requirement to use the CWM Designation once you have fulfilled the Certification Process. There is a requirement of 3 years of relevant work experience to get the CFP Certification and Designation. Certification Fee USD 100 Rs. 5,000/- Certification directly from USA. Examination Pattern In CWM certification there are 2 levels of examinations i.e. Level 1 and Level 2. The examinations are online and are conducted on Monthly basis across India. The duration of Level 1 examination is of 2.00 Hours and Level 2 is 3 Hours and all the questions are MCQ in nature. The Experience Pathway is exempted from Level 1 Examination In CFP certification there are five examinations. The examinations are conducted only on daily basis across India which loses the control of the Education Provider in the batch formation and conducting of classes. The Exam 1-4 are of 2 Hours each and Exam 5 is of 4 Hours and all the questions are MCQ in nature. The total examination cost for the student is Rs. 13,000/- for all the examinations. CWM has 2 Exams for Regular Student and 1 exam for experienced Student. CFP has 5 Exams for Regular Student and 1 exam for experience Student. Training Cost Per Student Ranging between Rs.30,000 to Rs.40,000 for classroom training and DLP Basic of Rs. 5,000/- is mandatory to be paid by the Candidate to the Education Provider Ranging between Rs.30,000 to Rs.40,000 for classroom training and DLP Basic of Rs. 10,000 - 15,000/- Class Room Training is priced approx. same. But Self Study option is cheaper for CWM. 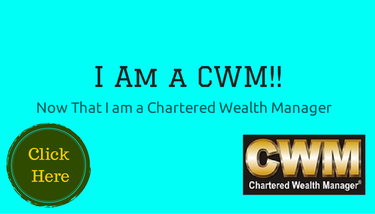 What is Chartered Wealth Manager? this courses his really good than cfp but i live in nasik his there any classes available in nasik and also get more detail about this course. EVERY FINANCE COMPANIES HAVING ITS OWN WEALTH MANAGEMENT TEAM. WITH THIS CWM WE CAN SHINEALONE FROM THE REST OF THE CROWD.